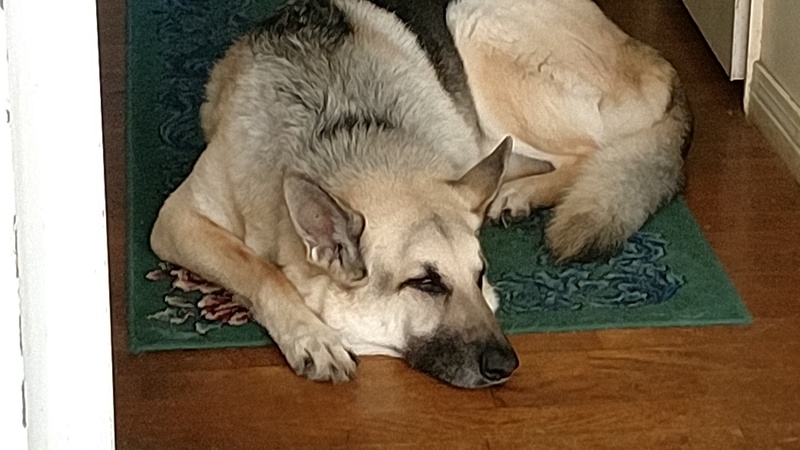 So I’m slaving away at the keyboard, writing The White Arrow, I look up and see my dog – the inspiration for Spark in The Bow of Hart Saga – doing what he normally does during the day recently: sleep. The real-life Spark is quite interesting while he sleeps since he’s a rather active sleep-barker. Yep, he often talks in his sleep. He even wiggles his paws like he’s running. I suspect he’s having a good dream about chasing something or guarding the backyard. When he gets going, he lets out some soft, half-woofs. It’s quite humorous unless its during the middle of the night. We actually took the dogs out for a nice long walk on a trail last weekend and they really enjoyed the outing. They raced from spot to spot sniffing and snorting along the trail. We haven’t done as much for several months so they needed the exercise. Yesterday, we got them out for a walk around a private lake near us and they had fun walking in the high grass and wild flowers or spooking the geese. I love dogs. They always provide blog fodder on a slow day, and they make life a little easier. Mine likes the places we take him to, but doesn’t actually like the ride.